If you use a search engine but don't find what you are looking for, which are you more likely to do? People are more likely to search again with a new keyword than they are to click onto the second page of search results. The split is fairly consistent among men and women. There isn't an obvious pattern among age either. People in the west & midwest are more likely to change keywords, whereas people in the north east & south are roughly equally likely to change keywords or go to page 2 of the search results. Suburban people are more likely to change keywords than to click on to page 2. There isn't much of an income correlation either. It would also be interesting to run this question again & include the option of trying another search engine as an answer. In the below poll we didn't make any distinction between AdWords & organic SEO investments. If we did I am not sure how it would have impacted the voting. 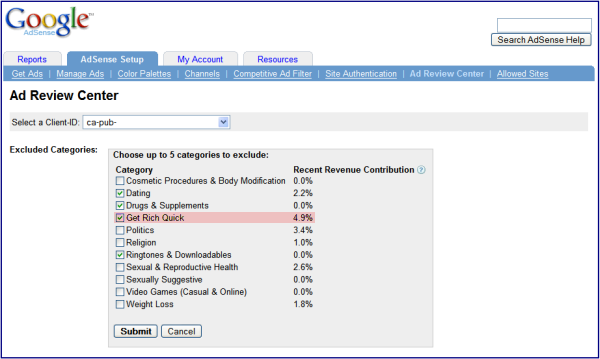 How do you feel about people paying for placement in search engines? Nearly 2 in 3 people dislike money manipulating search results. Women tend to dislike it slightly more than men. Older people tend to think money influencing search is manipulative, as do younger people who have not had their idealism beaten out of them by the harshness of the world. However the people in the 25 to 34 range who grew up with the web tend to like paid search far more than other groups do. People in the south tend to dislike money influencing search than any other region & people out west are more accepting of it. Perhaps the audience from California is more likely to understand how search impacts the local economy? Rural people dislike money influencing search more than urban people do. Income has essentially no impact on the perception of the influence of money in search (though there was insufficient data at the upper end of the income range). 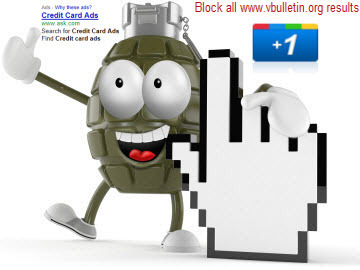 How do you feel about companies tracking your online behavior to target ads? Surprisingly, nearly 1 in 11 people like ad retargeting. However, over 3 in 5 people dislike it. 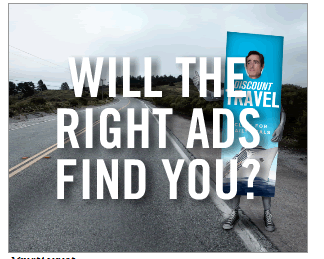 Women tend to think being stalked by ads is creepier than men do. Younger people who are old enough to be starting families tend to be more financially stressed than most other age groups, so they are likely more appreciative of relevant ads tied to discounts & such. Younger people have also used the web for so much of their lives that they are not as creeped out by tracking & privacy issues as older people are. People in retirement also like relevant ads, perhaps in part because they are feeling the Ben "printing press gone wild but no inflation" Bernake pinch & see their fixed income retirements collapse under artificially low interest rates tied to money printing game. People from the west coast are perhaps slightly more aware of the risks of online tracking. People from the south couldn't care either way. In the midwest the stereotype of the mom who clips coupons is shown in the data (though the sample size is small). On everything outside of disliking online tracking the margin of error is wide enough that it is somewhat hard to notice any strong patterns based on population data. It is also hard to see much of a broad pattern based on income levels. There isn't a strong correlation with income on this issue either. People cared a bit more at higher income levels, but there was also a wider margin of error due to small sampling size. Overture wasn't able to build itself into a credible search destination in part because their brand was positioned incorrectly as being primarily about paid ads that only would backfill with other results in when the ad auction was empty, so as a destination it was seen as a payolla engine. Likewise AOL peaked because it was seen as a walled garden & couldn't keep up with DSL and the open web. Search engines have recently pushed aggressively to revive the Web 0.1 game of walled gardens. Ever since I have been in search, Ask has been a (the?) leader in arbitrage. To this day IAC is Google's #1 advertiser & while AOL's search marketshare keeps dropping like a rock, Ask has managed to hold their marketshare relatively constant while over-monetizing the search results. Even though Ask exited algorithmic search, IAC's stock price is up over 160% since they split off their other companies. What makes that growth even more impressive is when it is compared against Google or Yahoo!. Yahoo! bowed out of search, outsourcing to Bing. Over the past year Yahoo! 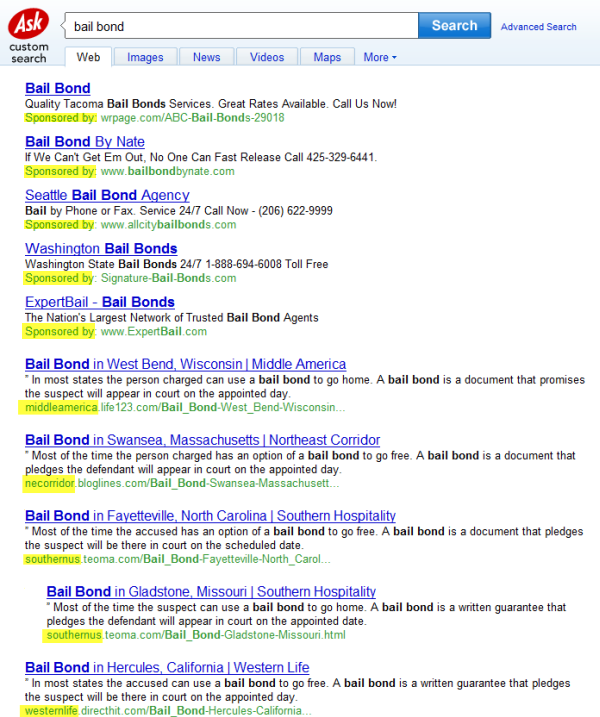 has dialed up on over-promotion of their verticals in the search results quite aggressively. While Yahoo! has been able to increase "engagement" they have done so in part at the expense of losing users. Surely some of that loss is due to Google's Chrome promotions, but that doesn't put Yahoo! in any stronger of a competitive position going forward, especially as Google clones their portal model. Increasingly, when we search & when we surf the web it is getting harder to leave the networks we are on. Facebook offers advertisers discounts for advertising other Facebook pages. YouTube signs premium content partners like Motor Trend (and backfill garbage) & then advertises the manufacturer YouTube channels next to that content. The user never leaves the portal throughout the entire process & brands are forced to buy their own pre-existing brand equity, or Google will sell it off to competitors. 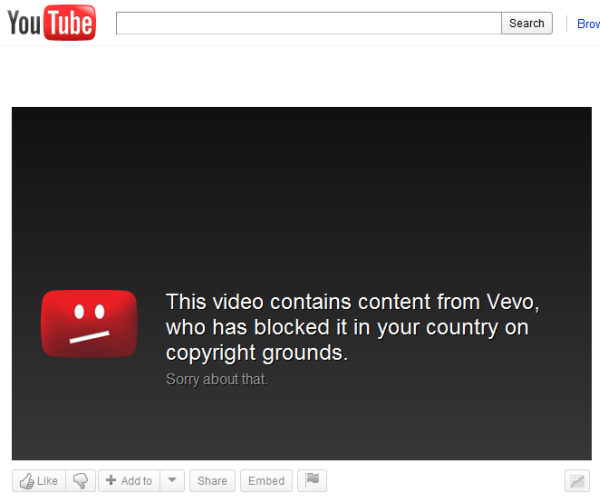 Today that is simply not true. Now that Google may show AdWords ads at the bottom of the search results, Google is testing showing fewer organic listings on navigational searches. 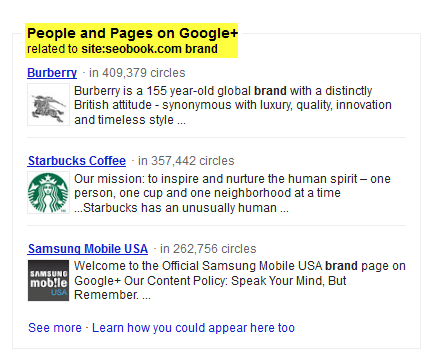 In some cases the 7 Google Places listings act as 7 results & the search results only contain 3 other listings. What's even uglier than this is a new enhanced AdWords sitelink option where a single ad unit takes up nearly a third of the screen real estate on a large monitor (and much more on a smaller screen). As Google redefines how credit is shared & competes more directly against publishers, those publishers need to adjust their business models. If Google grows too parasitic & captures too much of the value creation they will turn the media against them & give billions of Dollars worth of coverage to smaller search upstarts that actually respect their users. 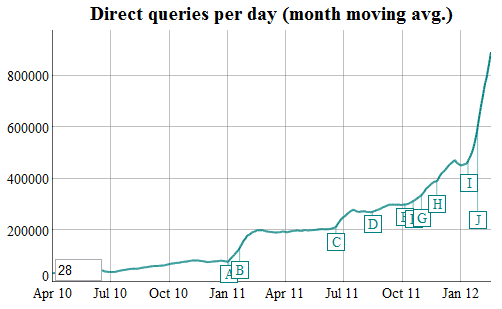 Both DuckDuckGo & Blekko are increasing traffic & monetization. Along with the nepotistic portalization of search, the rise of algorithmic journalism that can turn Tweets into an automated story puts further pressure on publishers. As the web becomes a series of walled gardens the opportunity in SEO diminishes, which is why some SEO websites want to drop the SEO label. Want to see what Google will look like in a couple years? Set your default search engine to Yahoo! or Ask & you can see the future today. The push for social garbage & nepotism over quality will last until Google's search traffic chart looks like the above Yahoo! chart. At that point we will focus more on Bing & other search engines. Thanks to John Andrews for highlighting the above industry trend. Some of Google's new search results look quite alarming in terms of every single link above the fold is either a paid ad, or links to yet another Google page wrapped in ads. I have a huge monitor & it is impossible for me to click *anywhere* above the fold on some search results without going through Google's toll booth or clicking off to yet another Google ad wrapped page. Those who coddled Google & gave Google the benefit of the doubt now have egg on their face, and the industry as a whole is poorer for their poor judgement & lack of stewardship. As absurd as the above behavior is, it gets worse. When Google acquired DoubleClick, Larry Page wanted to keep Performics (an SEO/SEM company). But since it would have been a flagrant violation of law for him to run an SEO company, they now decide that nobody should run an SEO company...telling consumers to simply forget about SEO even when they specifically search out information about SEO! You know Google's slogan: "maybe the best ads are just answers." And sometimes they are misdirection or scams that quite literally kill people. You can't be 100% certain which is which until long AFTER you click. And by then Google's cash register has already rang & it is off to dupe the next person. Comments turned off, as this is a conversation that NEEDS TO SPREAD. If you run a blog about SEO, you owe it to your readers & your industry to cover this topic. If this topic doesn't get broad coverage then pretty soon your career might be over & you will deserve it too. 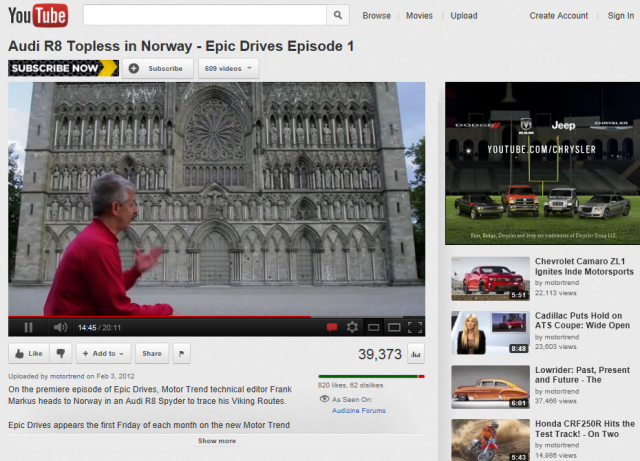 ... yet Google is testing a new ad unit where users have to fill out a survey before they can view the content. Then after the survey: "Thanks for your feedback. Candidate y supports your views on issue x." Advertisers then get a report like: "in Ohio, 84% of the 289,319 swing voters with an average household income between $32,400 and $67,250 think issue x is vitally important and have a 6:1 bias toward option A. They respond to it more strongly if you phrase it as "a c b" and are twice as likely to share your view if you phrase it that way. The bias is even stronger amongst women & voters under 50, where they prefer option A by a factor of 9:1." ... & Google is in an amazing position politically. It is thus not surprising to see how politicians have a hard time being anything but pro-Google, as they are the new Western Union. This isn't the first time Google experimented with cloaking either. Threadwatch had a post on Google cloaking their help files years ago & YouTube offers users a screw you screen if they are in a country where the content isn't licensed - yet they still show those cloaked pages ranking in the search results. It is common knowledge that you shouldn't mix business and politics, however if one looks at history, many of those who gave us those sage words did precisely the opposite - and often illegally so - selling us down the river. What is so obnoxious about Google's survey trial is that a big site that was hit by Panda was hit because they used scroll cloaking & didn't let the users get to the content right away. Googlers suggested users didn't like it & voted against it, and then roll out the same sort of "wait 1 moment please" stuff themselves as a custom beta ad unit. On the one hand they tell you to optimize your ad placements & on the other they tell you that those were not optimal & are so aggressive that they are spam. For a while there was a period of time where you could use something like "would Google do this" as a rule of thumb for gray area behavior. In the current market that won't work. 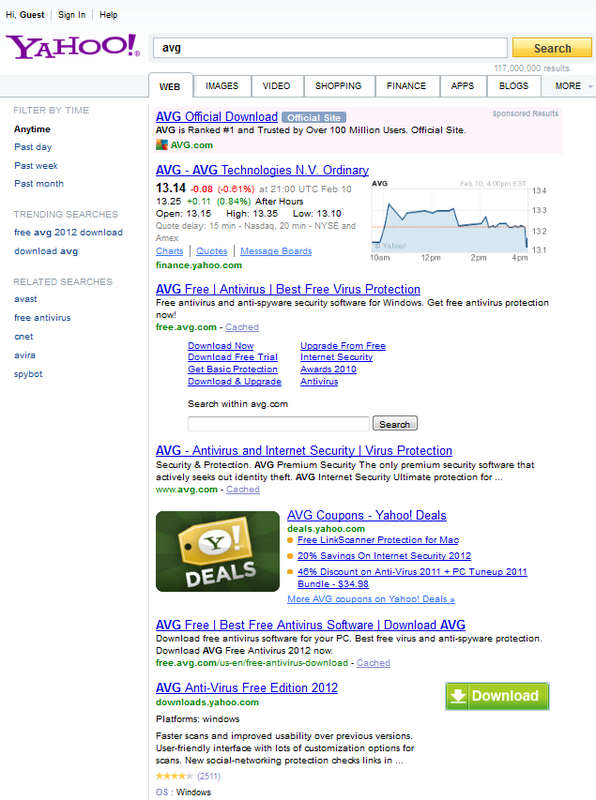 As ad units get more interactive & Google keeps eating more verticals the line between spam vs not will keep blurring.